So, as I promised my friend Jay, my first real post and project for the house is fixing up my living room which has been dubbed “A Nightmare in Pink” (extra cool points to those who get the reference). I am not a pink kinda gal. In fact, I hate the color pink for all intents and purposes. So, you can see how this room is a nightmare for me. Its all pink. Very pink. It is like walking into a bottle of Pepto-Bismol. Everything is pink- the walls, the ceiling and even the brick fireplace. Except the floors, which are a nice honey wood. 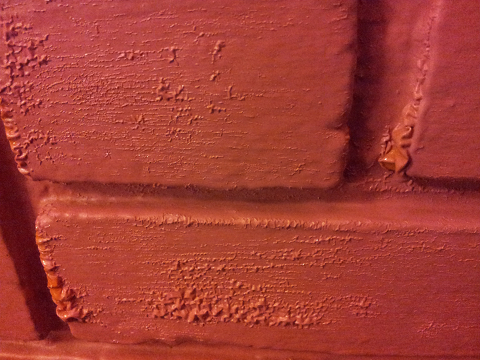 They painted the wood paneling on the fireplace wall pink as well. 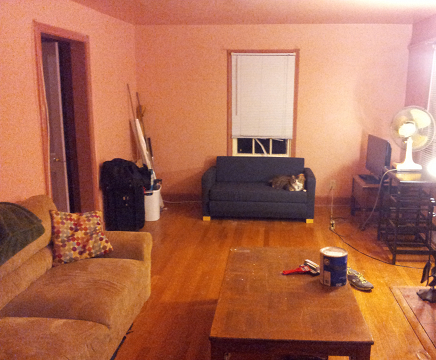 The woodwork around the windows and on the baseboards is a slightly darker pink. Ugh!! 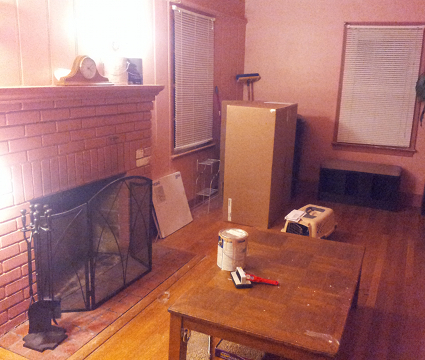 I love brick, so the first part of my project is to remove all the hideous pink paint from the fireplace. I do this despite many warnings from other blogs and home improvement websites, I am accepting the challenge. This post will also serve as my first product review for the paint remover I am using. 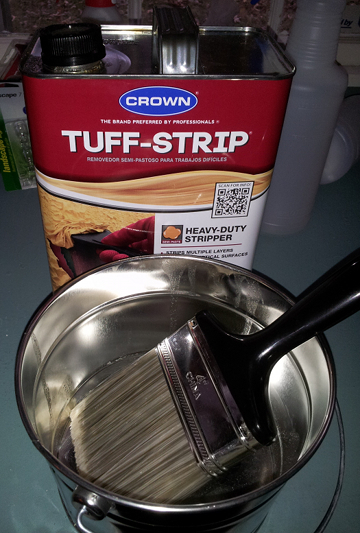 I chose Crown brand Tuff Strip Heavy Duty Stripper, which I got at Home Depot. I knew it would be quite a feat, so I opted for the heavy duty semi-gel remover. I am also impatient and it said it would start working in 10 – 15 minutes. I got the large can since I expect to do many coats, which claims to cover 100 square feet. I also got a 4″ paintbrush and a metal bucket, as prescribed on the back of the can. Make the pink run for its life! I decided to test it on a small area of the fireplace. I was worried the stripper would smell really bad, but it did not. Nice and easy! I put it on and set a timer for 15 minutes. I was impatient, so I checked after five. It already started to work. 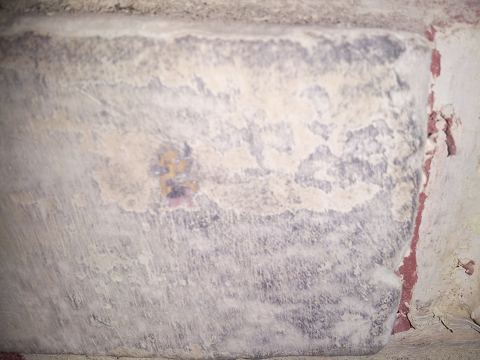 I waited the full 15 minutes and then scraped the bricks with a plastic scraper and used a rough scrubber sponge to get between the bricks and pull off some more paint. After one coat, some of the pink has been vanquished! I followed this with another, slightly thicker coat. I am not sure if there are multiple coats of white paint or if the stripper is less effective on the white paint. It seemed like a different type of paint, but I could not be sure. 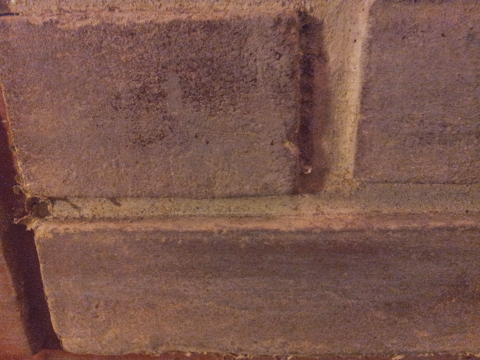 Starting to see some brick there? Unfortunately, I did not get to the brick yet, which is good because at this point it looked like grey brick, which I wouldn’t really want. The next day I did two more coats and finally got to brick. 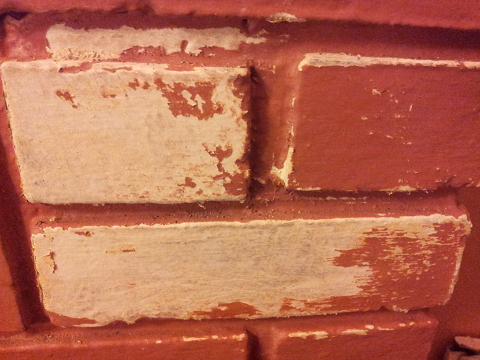 Looks like red brick, which is awesome! Unfortunately again, my scrubber sponge was covered in paint by this point and was just smearing the damp paint around, so I stopped for the night and went back to Home Depot for mineral spirits to clean up with. The red, it filters through. Now I am left with a dilemma- do I keep at it and go through several more coats of stripper to get to the red brick, or do I just strip off the pink stuff and paint the bricks again? I definitely want the bricks to look like bricks, but I could always skip the hassle of stripping the paint and just do a faux finish. I found this tutorial on how to do so, but I am still not sure what to do. I am a stubborn person, so I will probably plow on and strip the bricks, but I am still on the fence. « Welcome to the Duckpond!